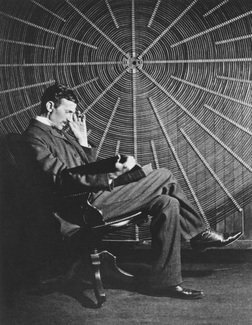 Tesla proposed two types of energy existed in the cosmos: scalar and electromagnetic energy. Because of the lack of technology to detect scalar energy, electromagnetic energy was more widely accepted and utilized. To prove scalar energy existed, Tesla experimented with abrupt discharges of electrostatic potentials, which released scalar energy from the vacuum of space also known as the “ether”. Tesla referred to “scalar energy” as “radiant energy” and felt that this was the primal force in the universe. At the heart of Bruce Copen Technology lies proprietary technology based upon a modified Tesla flat coil, which has the capacity to produce “longitudinal” or “scalar” impulses that can receive and transmit information through solid metal containers (Faraday Cages), travel long distances without any loss of power, as well as produce “over-unity” gains of energy.